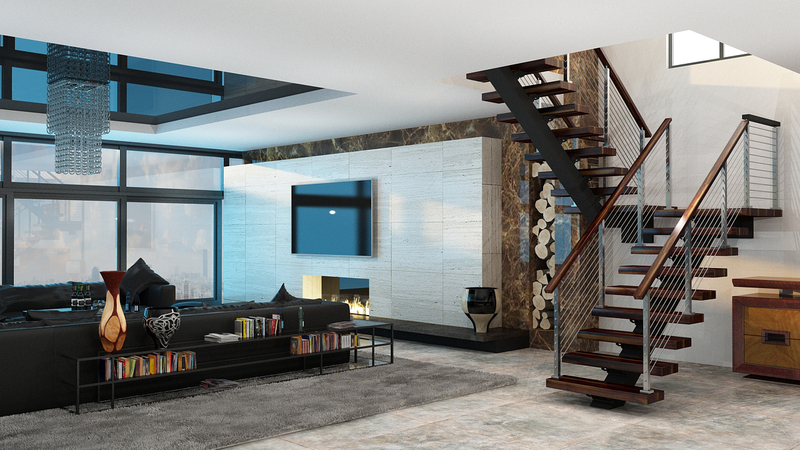 Beyond these features, FLIGHT floating stairs are configured to suit the layout of your home. The three most common configurations are explained below, but we can accommodate a range of custom stair arrangements to best suit your needs. This floating stair configuration is straightforward in more ways than one. Functionally, the simple silhouette doesn’t change direction. Aesthetically, these floating stairs are focused and clean, no additional intermediate supports required. The straight, single steel stringer FLIGHT system provides a strong, minimalist backbone for a modern stairway. As you can see, when paired with the warmth of honey-colored oak, the black powder coated stringer and cable railing system make a refined statement. Clean lines are always in style, and straight stringers create a striking, open-concept centerpiece. Stairs with a right or left turn in an L-shape form the 90° Turn FLIGHT configuration. The 90° Turn configuration adds visual interest, morphing into a new piece of art depending on where you stand in the room. Additionally, this configuration is more compact than straight stairways, saving space while still making an impact. When placed partially against the wall, the L-Shape provides a buffer of privacy between the two floors. But FLIGHT in a 90° Turn configuration doesn’t have to be against a wall – steel columns can support freestanding systems in the middle of the room for real architectural flair. Whether you need a single 90° Turn or several, Viewrail FLIGHT rises to the occasion to accommodate your design needs. Above, glass railing highlight the freshness of this space. Light, textured wood treads contrast beautifully with stainless steel posts, under-mounted for a clutter-free look. Starting at the dark floor, the eye is drawn upwards as FLIGHT ascends and turns the corner. White stringers would accentuate this space just as beautifully, disappearing into the light color scheme. 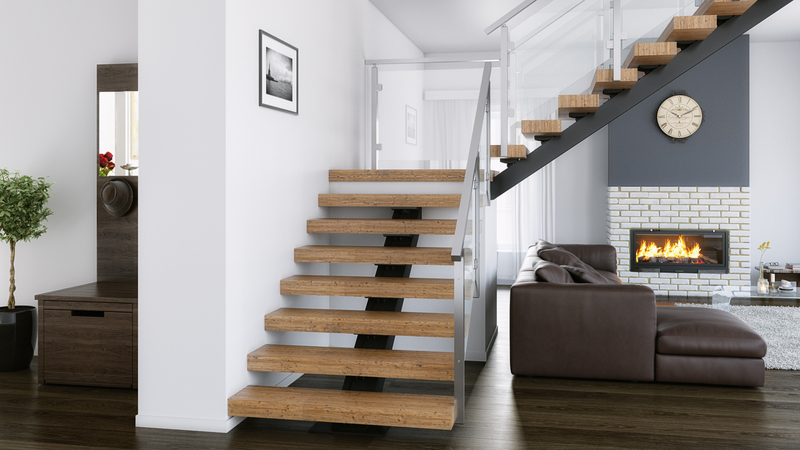 Versatile and sleek, Viewrail FLIGHT’s 90° stair configuration is an excellent addition to any space. For a full turnaround, FLIGHT in the switchback configuration rises halfway in one direction, then reverses at the landing to finish the climb in the opposite direction. The most compact design option, FLIGHT switchback configurations feature two large landing sections that meet at the center. This example shows a wall-mounted switchback, but with FLIGHT, floating stairs are not confined to the side of a room against a wall. Stand-alone platforms are supported by steel columns to create a switchback centerpiece exactly where you need it. 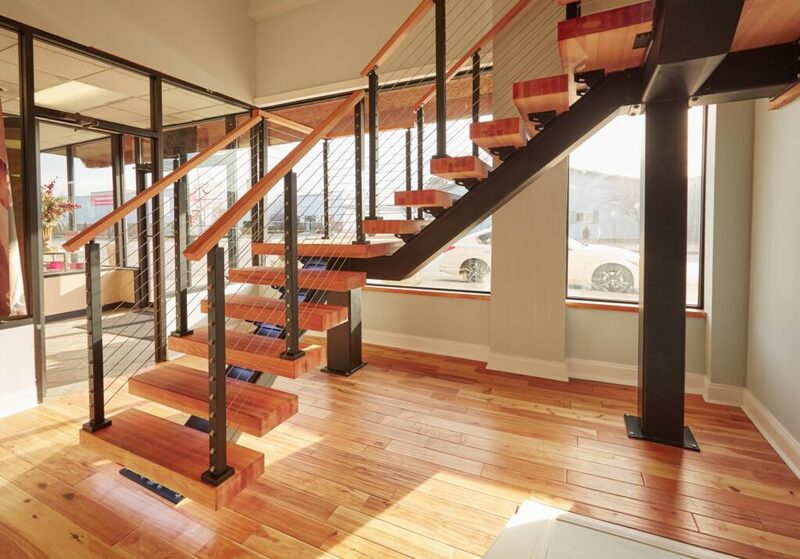 Styled in a dark stain, wood treads and handrail create a striking pair with the stainless steel rod railing. The black stringers simply melt into the background like a shadow, allowing you to recognize the beauty of the structure as a whole. Wondering if FLIGHT could be a fit for your space? 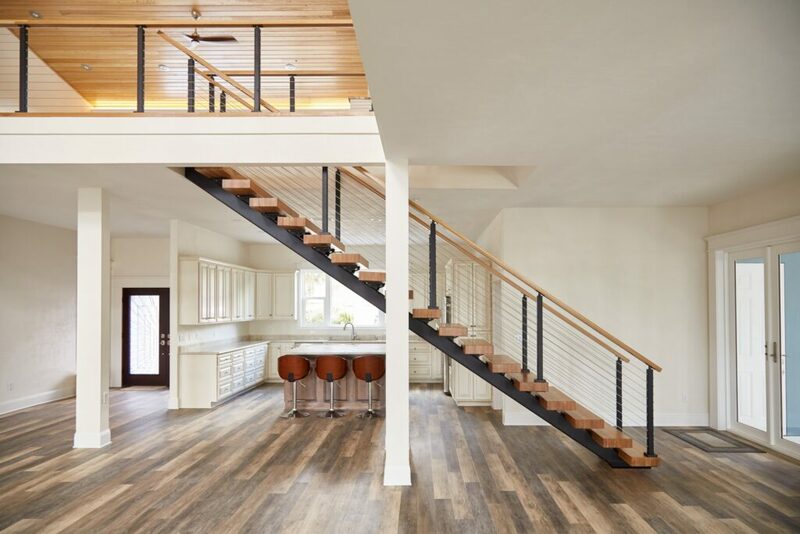 Contact our Design Team for a floating stair consultation through the Flight Quote Request Form, and for general ideas on pricing check out the how much do floating stairs cost page. A representative will reach out to you within 24 hours to discuss your project, or begin now and learn how to buy floating stairs.